A new video released by demonstrators shows a police officer beating a man in the head with a riot shield at the London G20 protest earlier this month. 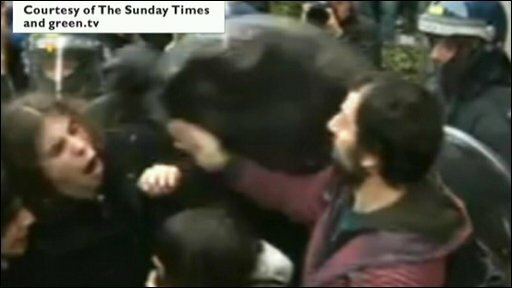 The man is barged with a shield on the side of his head in the footage, shown on the Sunday Times website. Scotland Yard said it would be assessed and referred to the Independent Police Complaints Commission if necessary. 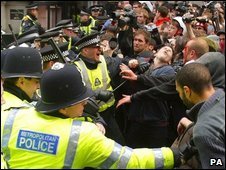 The IPCC earlier said it was looking into a third claim of police abuse at the protest. It follows probes into the death of one man and the assault on a woman. Newspaper seller Ian Tomlinson died after being pushed over by police on 1 April and a female protester says she was hit by police in the face a day later. The video of the latest incident to emerge was released by Climate Camp protesters. In it, 24-year-old IT worker Alex Cinnane is shown being forcibly hit in the left temple with a round shield by a policeman wearing a balaclava and a visor. The footage, which was edited before it was released, does not show Mr Cinnane making any threatening behaviour towards the police officer. "I had turned around to go to someone who was screaming because they were being crushed when he reached out and hit me on my forehead with his shield," Mr Cinnane told The Sunday Times. More footage on the nine-minute long video shows an unidentified officer punching a man as a line of police push protesters back. The third incident being probed by the IPCC is believed to follow a complaint that an officer used excessive force in Cornhill on 1 April. A Scotland Yard spokeswoman said it was taking steps to identify the officer involved in the incident which prompted the third referral. And Scotland Yard also said it was examining video footage from the protests which was released on Saturday by the Climate Camp group. A spokesman said: "This material has been passed to the Met's investigation team to make an assessment. "The investigation team is currently assessing the material. If necessary it will be referred to the IPCC." A policeman has already been interviewed under caution on suspicion of manslaughter after new tests overturned the initial post-mortem into the cause of Mr Tomlinson's death. Mr Tomlinson, 47, was filmed being struck and pushed over by a police officer. A fresh post-mortem examination found he died of abdominal bleeding, not a heart attack, as first thought. Lawyers for the family said the new post-mortem raised the likelihood of a manslaughter charge. Nicola Fisher: "Officer was very aggressive"
Film footage also showed an officer hitting Nicola Fisher, 35, from Brighton, across the face with his hand and on her leg with a baton on 2 April. "He just said 'get back', pushed me and then hit me across the face," she said. Ms Fisher admits pushing the officer. The sergeant accused of striking Ms Fisher works for the Territorial Support Group and has been suspended from duty pending the IPCC inquiry. 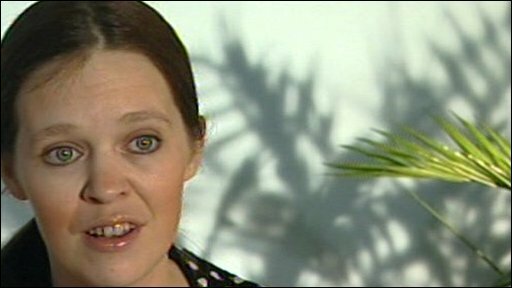 Ms Fisher, who is being represented by PR agent Max Clifford, was making her way to a vigil for Mr Tomlinson when the incident occurred.